Although, all the excitement with Mozilla's Firefox 4 has not been yet over, Mozilla has come up with the alpha version of it's forthcoming browser - Firefox 5! Currently codenamed as the Aurora, it is the Firefox 5 Alpha 2. 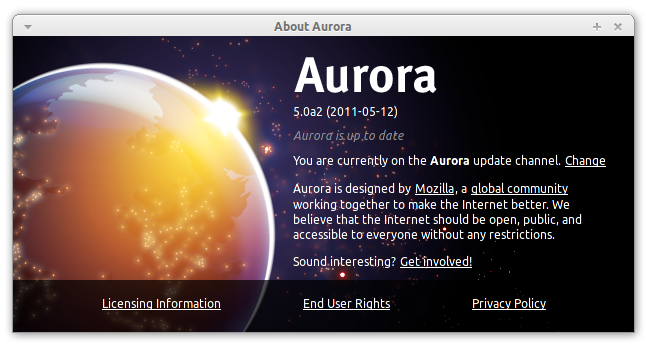 Well Aurora happens to be the general name for all forthcoming alpha versions of the Firefox browser, just like Chrome's Canary Build. With Aurora, you can experience the newest innovations on the Firefox browser (in an unstable environment though) and this is strictly not recommended for use on Production machines. So, here are the download links for Firefox 5 Alpha 2 for various operating systems. These packages are for users of the English language only. For a copy of Firefox 5 Alpha 2 in your language, see this list.